Nutmeg and mace are used in similar ways, nutmeg tends to be slightly sweeter and mace has a more delicate flavour. Mace is the thread that cover the dried fruit and nutmeg is the kernel inside the seed. Both are used for flavouring sweet and savoury dishes. Mace has a slightly more intense flavour and livens up meats and savoury dishes. Nutmeg is either ground or grated fresh in a nutmeg grater. Nutmeg is used throughout the Caribbean however it is particularly associated with the island of Grenada also known as the ‘Spice Isle’. 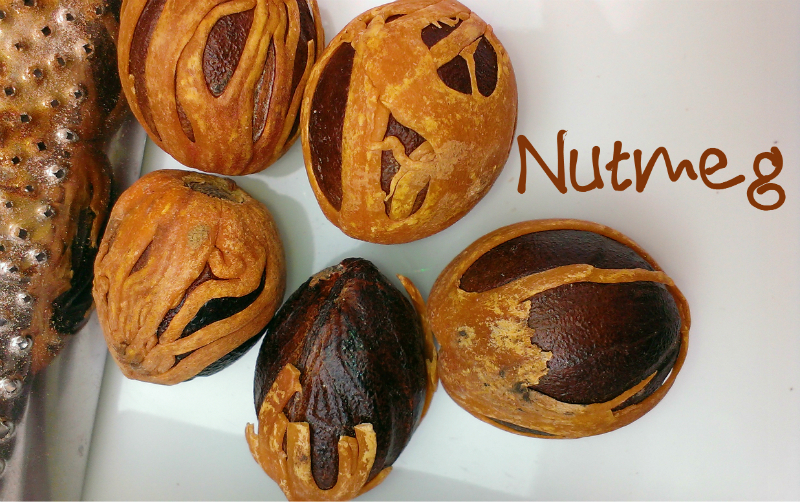 Grenadian Nutmeg is famous for its’ high quality and the island is the world’s second largest exporter of the spice. The common or fragrant nutmeg, (Myristica fragrans), is native to the Banda Islands in Indonesia, but was introduced to Grenada in 1843. Sprinkled on the top of a cocktail nutmeg is used in classic drinks including the Bushwacker, Painkiller, and Barbados rum punch. Used as a fragrance nutmeg is in many classic perfumes, including Chanel no.5. It creates an earthy, gently spiced undertone. You can use the oil to create your own natural perfume, mixed with Orange, bergamont or your favourite oil. The pericarp, which is the fruit or outer pod, is also used in to make jam or crystallized to make a candy. Visitors to Grenada can take tours to the Nutmeg factory and gardens and foodies can stock up on all the delicious nutmeg products.